On May 11 we took up our line of march in the direction of Raymond. We moved rapidly over the ground, now in bright sunshine and now in a torrent of rain, until late in the day, when we came to a halt and stacked arms on Roache's plantation, where we remained until the next morning. Gen. Logan ordered an advance against the enemy's position. Our regiment deployed and moved across an open field on the double-quick to a rail fence bordering the timber, when we quickly moved by the left flank and crossed to the opposite side of the Raymond road, then moved by the front and dashed into the timber. At this moment a loud shout reached our ears, coming from our companion regiments, "Go in, boys, we are with you!" We hastily moved forward to the opposite side of a narrow belt of timber and soon gained a position near an open field, where we were ordered to stand to arms and watch our front. Hardly had we reached our position when the battle opened in its wildest fury on our right, where, under cover of the timber, a heavy force of the enemy was massed under the command of Gen. Gregg. As our regiment was in position on the extreme left of our division, and the heavy fighting took place on the right and center, we were not so warmly engaged as were our companion regiments. It was trying to us to remain quiet, listening to the terrific roar of battle which deepened every minute only a short distance away, and yet know little or nothing of how goes the battle. But there we were in company with our companion regiments, and there to stay. Such was the fortune of war; in battle some regiments' losses were appalling, while others in close proximity escaped with a few slight wounds. We were, however, suddenly awakened to the fact that a heavy body of the enemy was moving in our front. In an instant the rattling click of gunlocks ran down the line of our brigade, and a terrible volley flashed from that wall of steel that carried death in its train. 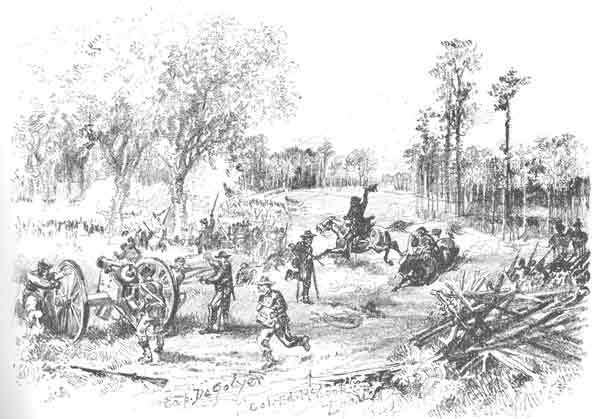 We were too earnestly engaged in watching our front and listening to the answering roar of the enemy to have noticed DeGolyer's battery, which had taken a position close to our left, and opened upon the enemy with shot and shell. About this time what appeared to have been a move of the enemy for the purpose of charging DeGolyer's battery was met by such a terrific fire that the enemy halted, then turned and fled. Logan, in the meantime, with a portion of his command, was moving to the extreme right, where they fell upon the enemy's left flank, causing the enemy to flee from all parts of the field, leaving Logan's proud command master of the situation. 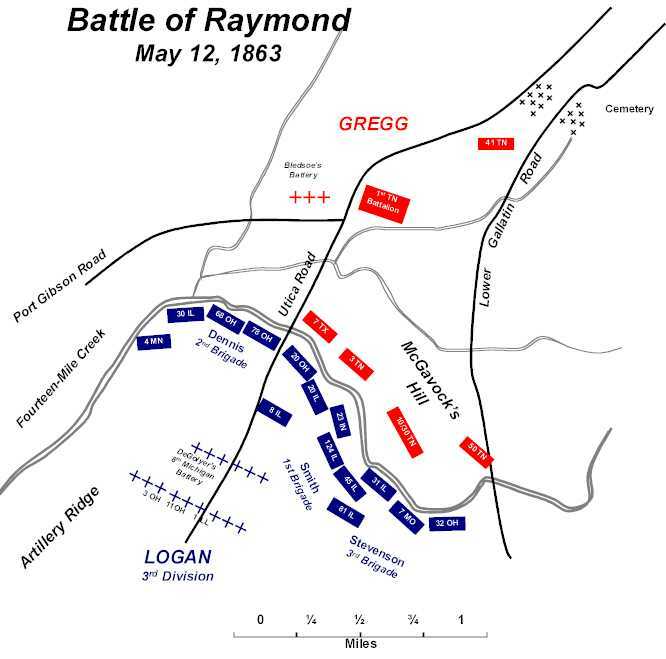 The battle of Raymond, which Gen. Grant said was one of the hardest-fought battles of the Vicksburg campaign, was fought and won by Logan's Third Division alone and unaided. The battle raged with wildest fury about four hours, during which time Logan's loss in killed and wounded was very heavy. Our regiment, however, was fortunate to escape with a few slight wounds. The enemy's loss was much greater than Logan's. A captured rebel officer, in speaking of the battle, said: "We saw your men coming in on our left, and held our fire until you were in close range, and then poured a volley right into your faces. We supposed that when the smoke lifted your line would be gone, but imagine our surprise to find you coming right along, and had not my men got out of your way you would have walked right over them." After the battle, while waiting for orders to move, the writer walked down the line to the right where once had been a living wall of gray. At one place I could have walked for some distance over the bodies of the dead, the result of an enfilade fire by Logan's men. As the sun was nearing the western horizon we went into camp in the suburbs of the town of Raymond. Early the next morning we marched out on the Clinton road, our regiment acting as rear guard of the entire division. During the afternoon the heavens wept great billows of moisture, but we tramped on through mud and storm, and about sundown stacked our arms in the streets of Clinton. The leading brigade of our division entered Clinton early in the afternoon, and when we came up we found the boys busily engaged in celebrating the event by making bonfires of the inflammable part of the Railroad. Originally published in The National Tribune, Campaigning with Buckeyes. Ten Thousand Miles with the 68th Ohio . M. B. Loop. September 27, 1900, October 4-25, 1900, November 1-29, 1900, December 13, 1900. When the arrow was adopted as official badge for soldiers of the 17th Corps. Army of the Tennessee. Gen. Frank P'. Blair Jr. quipped that it symbolized "their swiftness, the point their firmness whenever they strike. and the feathers their liking for chickens." Pvt. Myron Benjamin Loop would have agreed, knowing well his own regiment's predilection for long. hard marching, fighting and foraging. He belonged to the 68th Ohio Volunteer Infantry, a veteran 17th Corps organization that saw nearly four years' service during the Civil War, much of it under Grant, Sherman, McPherson. Logan and Howard in the Army of the Tennessee. Observant and steadfast in keeping a daily wartime diary. Loop later relied on it heavily to compose a memoir that was serialized in 21 issues of The National Tribune. His regiment's entire field service was traced. from Fort Donelson and the Hatchie river in l862. Raymond, Champion Hill and the trenches of Vicksburg in 1863 Atlanta and Savannah in 1864, to closing scenes in 1865 in North Carolina, Virginia and Washington, D.C. Along the way the 6Sth Ohio trawled nearly 10,000 miles through the Confederacy, as Loop proudly pointed out: "We were on the soil of every Southern state except Texas and Florida." The journey was indeed a long one, at times fraught with hardship, sickness and boredom, at times with intense combat and celebration of victory. In July 1865, with the war over and Union soldiers facing muster-out, Loop reflected: "Our last evening together ... was rather less cheerful than many others covering a period of months and years, realizing something akin to pain, knowing that on the following day we must part, perhaps forever. While we all rejoiced in the thought of returning to the homes and friends we had left in 1861-62, yet we knew too well that the ties of comradeship which were forged around our campfires could not be sundered without many a sigh of regret." 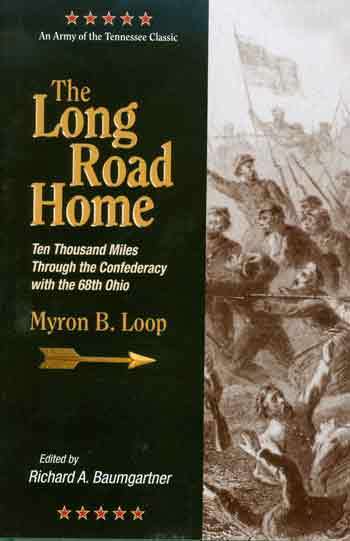 Because an official 68th Ohio history never appeared in print, The Long Road Home doubles as a useful substitute. For this Blue Acorn Press presentation, historian and editor Richard A. Baumgartner has supplemented Loop's narrative with letter and diary excerpts written by 40 other regimental officers and enlisted men, and added 22 photographs and engravings.